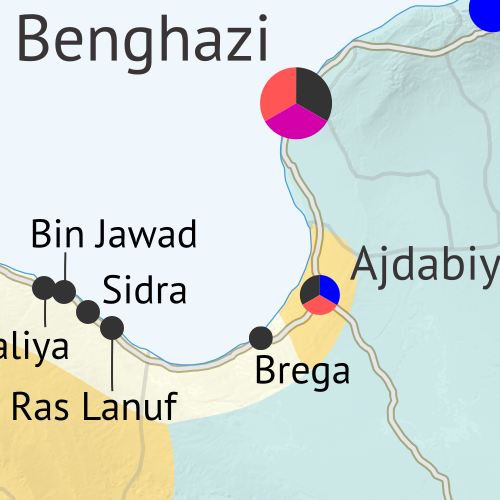 This is the second of a pair of Libya map reports, the first one chronicling the major political realignment that occurred in Libya between March and May of 2016. The past four months have seen a drastic reduction in "Islamic State" (ISIS/ISIL) control in Libya, with the group now barely holding any territory in the country. Meanwhile, the struggle continues between Libya's two rival governments, as well as other religious hardline militias. See all this and more on the latest update to PolGeoNow's concise, professional Libyan Civil War control map, which comes with a timeline of changes since our May 2016 Libya map report. Up-to-date map of current territorial control in Libya, color-coded for the UN-backed Government of National Accord (GNA), the rival Tobruk parliament (supported by General Haftar's Libyan National Army), "Islamic State" (ISIS/ISIL) fighters, and other religious hardline groups. Locations of recent fighting and military operations, including Sirte, Ajdabiya, Abu Grain, Bin Jawad, Harawa, and more. Detailed timeline of important events and changes to territorial control since May 10, 2016, with all sources cited.